The ending of the secret of Elohim (Alahim) is revealed in the pages of this incredible work. This amazing 96-page study will be hard to put down once you begin reading it. 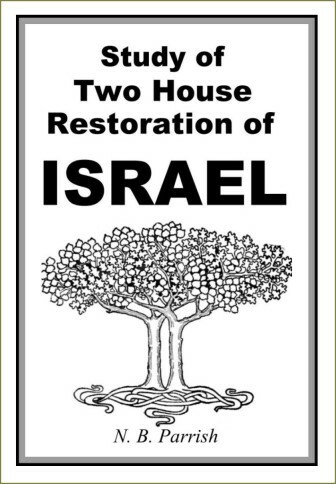 It flows logically through Scripture, showing clearly that Israel was divided into two "houses" and the vast majority of Israel don't even know that they are. The end times -- which we are definitely seeing now -- is when Scripture indicates this monumental event will occur: The re-gathering of Israel! The "scattering" of Israel was intentional (Amos 9:9). "He Who scatters Israel will gather him" -- Jer. 31:10. Fishermen will be sent to gather them out of the nations where they were scattered (see Jer. 16:14-21). You will see that the "secret of Alahim" spoken of at Ephesians 3 and Revelation 10 are solved through an understanding of the Two Houses: the House of Israel, and the House of Yahudah. the sign of which is: the Sabbath (Shabath). Read Ezekiel 37, Jeremiah 3, Amos 9:9, Revelation 10, Ephesians 3, and then Acts 15. The Creator's Name is definitely involved in this ending of Alahim's secret, and this study deals with that issue as well.